Video demo: J.S.Bach - F.Busoni - F.Lips. Chaconne in d-moll (D minor) BWV 1004. 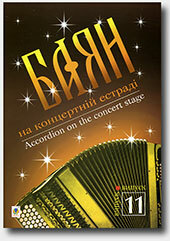 Performed by Artem Nyzhnyk, bayan (accordion). (Attention! Artem Nyzhnyk plays different transcription then in this edition. Video demo: Volodymyr Podgorny. Retro Fantasy. Parts II, III: "Morning and Evening", music by M.Blanter and "Anema e core" ("Soul and Heart" or "With All My Heart and Soul"), music by S.d'Esposito. Video demo: Volodymyr Podgorny. Retro Fantasy. Parts VII, VIII: "Moscow Windows", music by T.Khrennikov and "Moon Waltz" from the movie "The Circus", music by I.Dunayevsky.